Each mobile shelving system is tailor-made to your specific requirements, using a range of standard components to suit both the products you need to store and the available space. 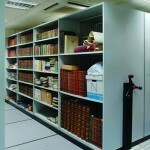 Mobile shelving is often the most cost-effective way to achieve the highest density of storage possible within your working environment. The initial capital outlay is slightly higher than static shelving but the gains in storage capacity and/or the reduction in floor space required will far outweigh the additional cost. Indeed, most purchasers benefit from a quick return on their investment! The shelving is mounted on mobile bases, which run on tracks that are either laid on, or set into, the existing floor surface. A good variety of track types and flooring options are available to suit most situations. The mobile bases are moved aside, as required, to form an aisle to access any given point in the system, thus eliminating the need for multiple aisles. Are the bases difficult to move? The bases themselves move by means of a hand wheel that engages mechanical reduction gears, which, in turn, drive wheels, hidden beneath each base, along the tracks. The reduction gearing results in effortless movement of even the most heavily-laden shelving and, if that is not enough, we can even provide power-driven bases ranging from simple push button operation to full remote control. Will the mobile system spoil the look of my premises? ESE is an interiors specialist and can design a system that will harmonise with your existing décor or corporate theme. A variety of decorative end panels and other components can be carefully selected to give a finish that ranges from a traditional shelving look to a contemporary false wall appearance. The choice is yours! Are mobiles safe to use? On "surface-mounted" mobile systems, modular lay-in floors are used to prevent trip hazards being caused by the tracks. On the "built-in" systems (usually in new build projects), the tracks are fitted before the final cement screed is applied, to achieve the same result. Low tolerances are used throughout the systems to avoid injuries to fingers and toes. If required the ESE installers will also provide induction training for your staff. Is floor loading an issue? Sometimes there can be an issue if you have raised floors or wooden floors. However, ultimately the answer to this question is driven by your storage needs. In most cases, all these factors can be successfully overcome to provide an economical, functional design solution. ESE always advises clients from the outset of any special design considerations applicable. As you would expect, we provide complimentary surveys and advice to ensure that the right design solution is found at the right price. How quickly can mobiles be installed? We are normally able to "fast track" a survey, design, or quotation response to any given enquiry if you require. Most projects can be supplied, delivered and installed within 2-3 weeks of your instruction to proceed. However, this can depend on the chosen components and finishes. If you have a specific deadline to meet, please make sure you tell us as soon as possible to ensure we bear this in mind from the outset of the design. Will there be any disruption during installation? Normally there is very little disruption as mobile storage systems are mainly delivered to site in a pre-finished 'kit' form and ESE has an immense wealth of experience in installing all types of mobile shelving. We offer a very flexible approach to installation and programming, which includes out-of-hours and weekend working, if required. We are also accustomed to working on site alongside other trades with tight deadline pressures. One of our Project Managers will liase with you as to the most appropriate method of working around your day to day operation, most installation work can be programmed at a time and date to suit your business needs as long as we are made aware of your needs.